The last couple of years for the Fourth of July I’ve blogged about the most prominent patriotic comic book superhero, Captain America. This time I wanted to do something a little different. I’m taking a look at a character who was inspired by Cap: Shannon Carter aka American Dream, who was created by Tom DeFalco & Ron Frenz. 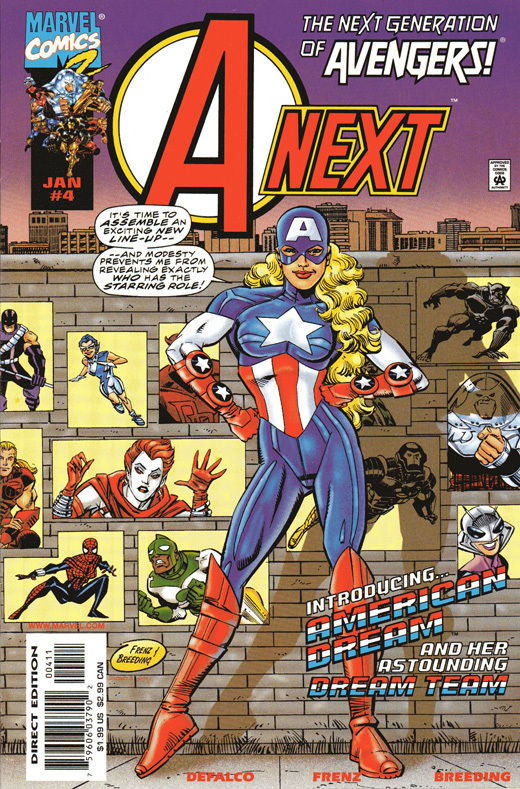 American Dream was introduced in A-Next, one of the titles that comprised the short-lived “MC2” line at Marvel Comics. These all spun out of What If #105 (Feb 1998), the debut of May “Mayday” Parker, the teenage daughter of Peter Parker and Mary Jane Watson in a reality where she was rescued after being abducted by Norman Osborn. What If #105, which was set approximately 15 years in the future, had Mayday becoming Spider-Girl. 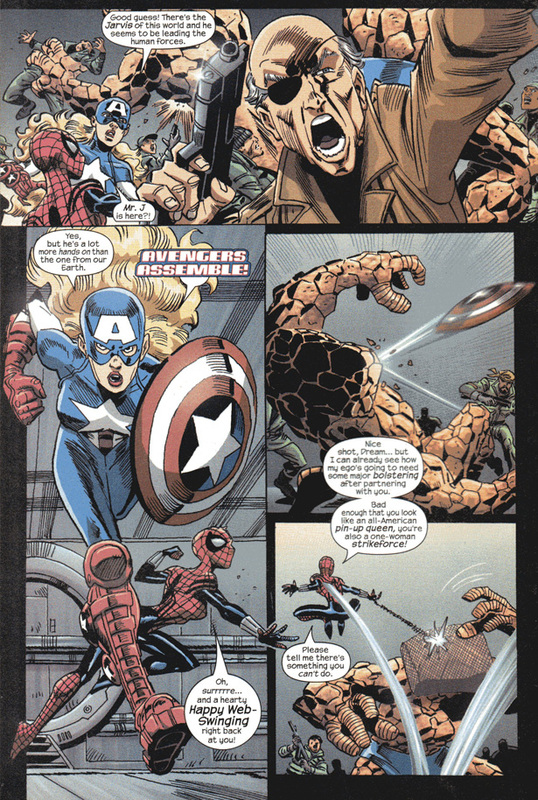 What If #105 was a big hit, and in late 1998 the MC2 books started. Most of them unfortunately did not last long, although the Spider-Girl series written by DeFalco had a very lengthy run. A-Next introduced “the next generation of Avengers.” In this timeline, after a catastrophic battle in a parallel reality (yeah, another one) the Avengers disbanded. A decade later, due to the scheming of the Asgardian god of evil Loki, a new team of Avengers assembles. Yipes, that is always happening to Loki! Well that sounds ominous! However, in A-Next #4 by DeFalco, Frenz, Breeding & Paul Ryan, we find out that these four actually intend to join the Avengers. For the first time we see Shannon in costume as American Dream and properly meet her comrades Freebooter, Bluestreak and Crimson Curse. This is also where we find out Shannon’s last name, and it is immediately apparent that she is intended to be a relative of S.H.I.E.L.D. agent Sharon Carter. DeFalco & Frenz intended the “Dream Team” to be a tribute to the “Kooky Quartet” introduced way back in Avengers #16 in 1965. The cover to A-Next #4 is even a nice homage by Frenz & Breeding to the Jack Kirby cover of that classic issue. By the way… Bluestreak really needs watch those wandering hands! Maybe the Avengers should be required to attend a seminar on sexual harassment in the workplace? I immediately took a liking to American Dream. Frenz did a superb job designing her, effectively modifying the classic style of Captain America’s uniform into an eye-catching, dramatic costume for a female character. So who exactly is Shannon Carter? A few issues later DeFalco confirms that she is a relative of Sharon, who at this point is deceased. 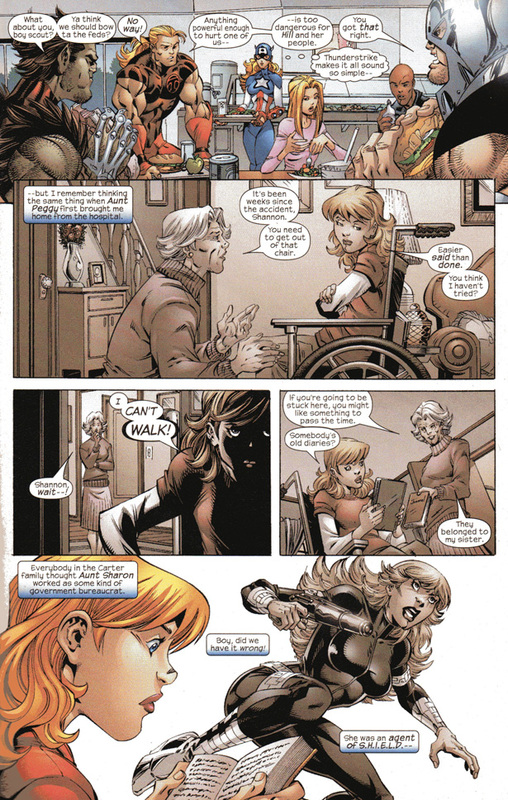 DeFalco would briefly touch upon her origin in Spider-Girl #32 (May 2001) before elaborating upon it in detailed flashbacks within a five issue American Dream miniseries (2008) illustrated by Todd Nauck & Scott Koblish. Shannon’s father was a cousin of Sharon Carter. When she was only a child Shannon’s parents were killed in a horrible car accident, and Shannon herself was seriously injured. The orphaned Shannon was adopted by her aunt, Sharon’s older sister Peggy. Peggy, hoping to motivate the mourning, depressed Shannon, gave her Sharon’s diaries to read. Shannon, inspired by reading the experiences of Sharon and her boyfriend Captain America, finally entered physical rehabilitation and began the long, arduous road to recovery. When she could once again walk, the diaries also motivated Shannon to train relentlessly, and she eventually became a skilled athlete. Shannon wanted to follow in the footsteps of both her Aunt Sharon and Captain America. Seeing her niece’s determination, Peggy introduced her to Clint Barton, formerly Hawkeye, who began instructing her. It was at Clint’s dojo that Shannon would meet the other future members of the Dream Team. Clint originally envisioned Shannon taking on the identity of Nomad, but she informed him that she wished “to evoke the image of Captain America.” Clint warned her that “Wearing the flag is like painting a bullseye on your chest” but Shannon was undeterred. 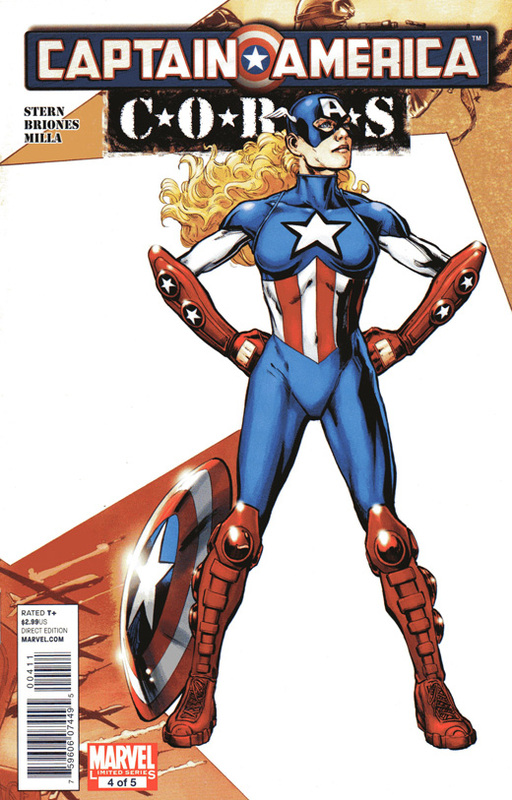 She assumed the role of American Dream, which would soon lead to her joining the new Avengers. It is definitely a stirring speech worthy of Steve Rogers himself. DeFalco’s scripting for Shannon in this scene is of course still extremely relevant to our country, especially in light of the events of the past month. American Dream quickly becomes a mainstay of these new Avengers. Several issues later, in A-Next #10-11 by DeFalco, Frenz & Al Milgrom, the team journeys to the dystopian nightmare world where the original Avengers fought their final battle. In this reality the Red Skull assassinated Hitler and led the Nazis to victory in World War II. In the present day the Skull’s successor Doctor Doom seeks to expand this fascist empire to all other alternate realities. After helping to thwart Doom’s plans a decade before, Captain America stayed behind to organize a resistance movement against the totalitarian regime. At first Cap is unhappy to meet these new Avengers and orders them to return home, fearing they will be killed. American Dream and the rest of the team refuse and they join Cap in his assault on Doom and his super-human Thunder Guard. Doom is narrowly defeated, with Crimson Curse apparently sacrificing her life. Before returning home, these new Avengers are finally given a nod of approval by Cap. America Dream gains the shield of that Earth’s Cap, who was killed decades before by the Skull. A-Next ended with issue #12, but American Dream has continued to pop up since then. Like many other denizens of Earth-982, she and her teammates would show up from time to time in Spider-Girl. One noteworthy story was the six part “Season of the Serpent” by DeFalco, Frenz, Pat Olliffe, Al Williamson & Sal Buscema that ran in issue #s 54-59 (Jan to June 2003). During that arc Spider-Girl, who has been fighting against the Soldiers of the Serpent and their leader the death-god Seth, joins American Dream on a brief trip back to the alternate Earth to enlist the aid of Thunderstrike and the original Captain America. 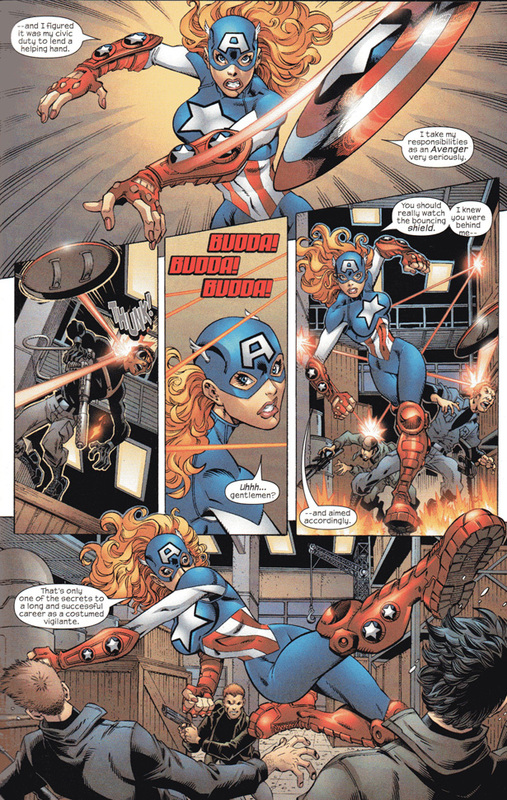 American Dream is among the numerous characters to appear in the miniseries Last Hero Standing (2005) by DeFalco, Olliffe & Koblish, and its follow-up Last Planet Standing (2006). She is one of the heroes who plays a vital role in preventing Galactus from destroying the entire universe. This led into the Avengers Next miniseries (2007) by DeFalco, Ron Lim & Koblish. Months before, during Last Hero Standing, Captain America had been killed by Loki, and Shannon finally realized the enormity of following in his footsteps. A major theme of Avengers Next is her uncertainty if she and the rest of the team are capable of living up to the original Avengers. A year later Shannon received a solo outing in the aforementioned American Dream miniseries, which I enjoyed. DeFalco did a good job delving into Shannon’s past. He also showed her present-day attempts to establish a private civilian life while also serving as an iconic member of the Avengers, something that Cap himself also struggled with often. I know that among certain readers DeFalco’s writing is an acquired taste. He has a very Silver Age style to his work. At times he tries a bit too hard to make his dialogue humorous or dramatic, resulting in rather corny or stilted scripting. Nevertheless, considering how many writers want to do superhero comic books that are “realistic” or “dark,” often with variable results, there is definitely a refreshing, fun quality to DeFalco’s more traditional approach. The art by Nauck & Koblish on American Dream was fantastic. I was already a fan of both artists before this miniseries came out, so it was great to see them work together. American Dream has also popped up in stories by other writers. She was one of the literally hundreds of alternate reality Avengers to make cameos in the sprawling, epic twelve chapter Avengers Forever series (Dec 1998 to Feb 2000) by Kurt Busiek, Roger Stern, Carlos Pacheco & Jesus Merino. 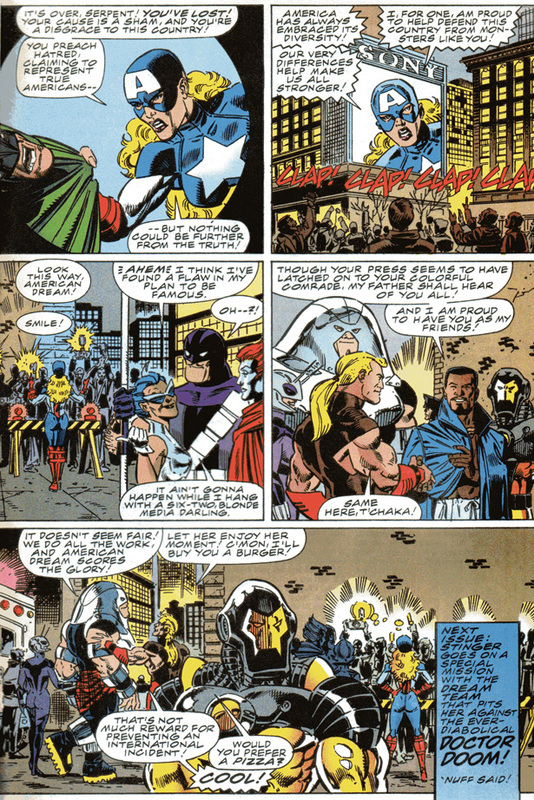 A decade later Stern had the opportunity to write a story that properly co-starred American Dream when Captain America Corps was published in 2011. It was illustrated by Phillippe Briones with covers by Phil Jimenez. This five issue miniseries featured several incarnations of Cap from various time periods, namely Steve Rogers from 1941, U.S. Agent and Bucky Barnes / the Winter Soldier from the present day era, American Dream from Earth-982 and Commander A from the 25th Century. The Elder of the Universe known as the Contemplator gathered them together in order to thwart Cap’s old foe Superia, whose reckless attempts to alter history threatened to unravel all of reality. I have always enjoyed Stern’s work on Captain America. Stern’s short run with John Byrne & Josef Rubinstein on Cap’s solo series is justifiably referred to as classic, and his longer run writing Avengers in the mid-1980s is also extremely well-regarded. 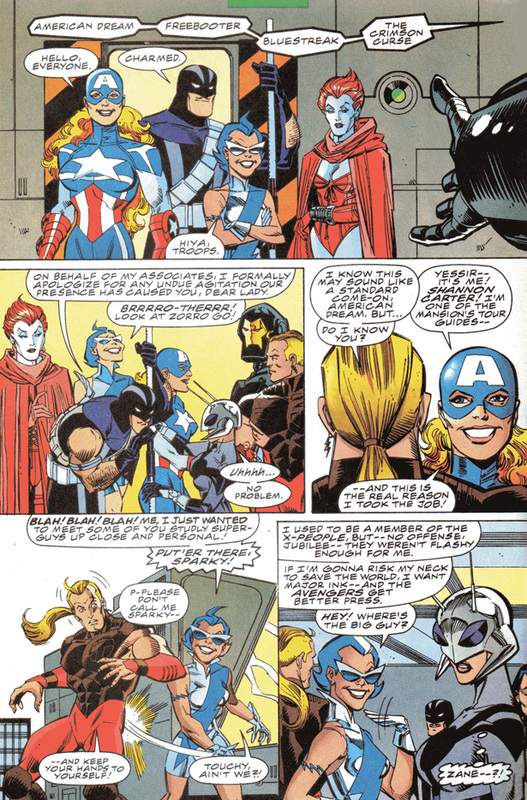 Since then Stern has occasionally had the opportunity to return to the character, such as in this Captain America Corps miniseries. It was a really exciting read. It was great to see Stern team up American Dream with Steve and Bucky. Offhand I don’t recall if American Dream has appeared in the last several years. Hopefully at some point she will show up again. I would certainly be happy if DeFalco had another opportunity to write her and the other Avengers of Earth-982. Of course, sooner or later Marvel ends up reviving any & every character that they have ever published (just look at all of the parallel universes and old crossovers that are being revisited within the current Secret Wars mega-event). So cross your fingers that one day we will see Shannon Carter return.